Ebola death toll in DR Congo crosses 410, WHO fear the disease, could spread to the neighbouring countries. Kinshasa: By each passing day, the Ebola outbreak in DR Congo is evolving into a more dangerous form than it is at present taking the death tolla bove 410. Fears have been expressed that the epidemic could continue for six more months and the World Health Organisation (WHO) has warned that it could also spread to the neighbouring countries. 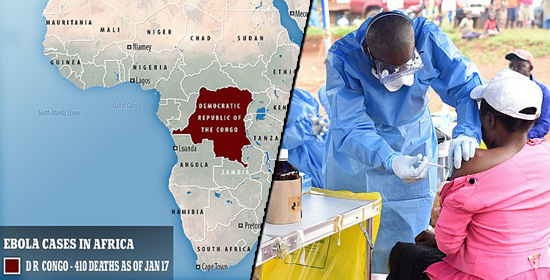 The Ebola epidemic was detected in DR Congo, in the month of August last year. Thereafter, the extensive campaigns implemented by the WHO and the other voluntary organisation, have failed to contain it. The eastern part of the country is the worst affected by Ebola which is also an active war zone. Therefore, the local agencies and voluntary organisations have claimed prevention of the epidemic cannot be controlled. Larry Garrett, an analyst and expert, at Council for Foreign Relations, while expressing severe concern over the epidemic in DR Congo, have pointed out the fact the number of deaths due to Ebola are increasing all of a sudden, out of nowhere. Even though the number of victims is increasing in the North Kivu Province, Garrett warned that no concrete reasons could be attributed to the spread of the epidemic. He has also claimed that the epidemic is acquiring a different proportion as there are a significant number of women in the people contracting the disease and the number of deaths. The extent of the epidemic is increasing since the last five months and nearly 670 people have been infected. But it is believed that these numbers can increase exponentially as many people have not reported for testing because of the ongoing conflict and anarchy like situation in DR Congo. WHO has expressed fears that this epidemic can spread to Uganda, Rwanda and South Sudan. Fears are also being expressed that the epidemic may last for six more months and the number of people affected can double. This epidemic, started in August, is the tenth Ebola outbreak in DR Congo. The country was hit by an Ebola for the first time in 1976.